Animal Husbandry and Fisheries Minister Talasani Srinivas Yadav at the Gulf Food-2018 food trade show in Dubai on Tuesday. Hyderabad: In yet another attempt to promote food processing industry, the Telangana State government has decided to establish a meat processing unit in every district headquarters in public-private partnership (PPP) mode. While the State government will provide necessary land, water, power and other resources, the investors can establish their meat processing units. Animal Husbandry and Fisheries Minister Talasani Srinivas Yadav, who is participating in the ongoing Gulf Food-2018 food trade show in Dubai, said on Tuesday that the State government would sanction necessary clearances through a single-window system according to its industrial policy TS-iPASS. The government would ensure uninterrupted power and water supply besides providing trained manpower to meet the industry requirements. “We will maintain all standards and follow guidelines in terms of meat processing and exports,” he explained. Telangana State exported about 59,800 metric tonnes of buffalo meat and another 420 tonnes of sheep meat to foreign countries during the financial year 2017-18. To increase sheep meat production, the State government took up the prestigious sheep distribution scheme where it had distributed over 42 lakh sheep so far that resulted in reproduction of about 18 lakh lambs taking the total sheep population to over 2.3 crore in the State. About 100 stalls comprising meat, chicken, eggs and milk products were put up by participants from India at the ongoing food trade show. Telangana State Agriculture and Processed Food Products Export Development Authority (APEDA), Al-Kabeer, and Mohd Saleem and Company of Chengicherla were among those which participated in the food trade show on behalf of Telangana State. The UAE-based retail chain Lulu Group, promoted by NRI businessman Yusuffali MA, is likely to establish another food processing unit in Telangana State. 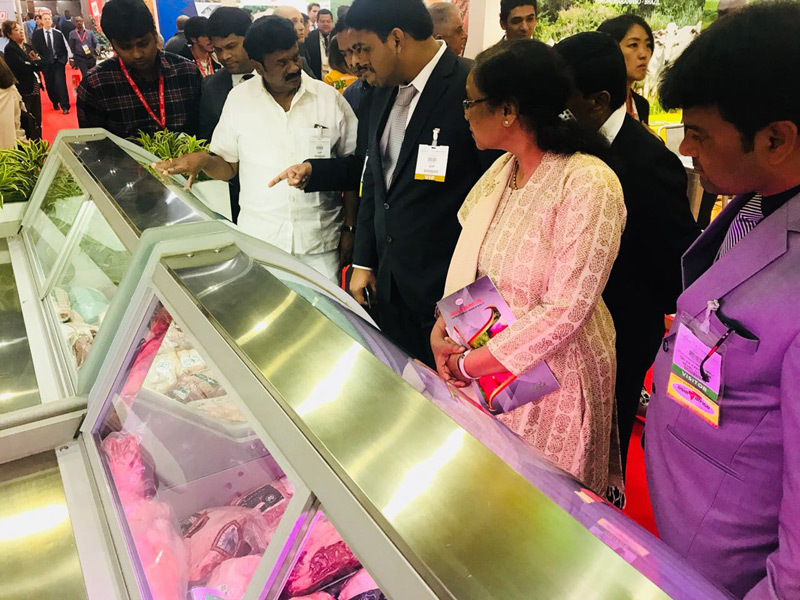 They evinced interest in setting up a meat processing and export unit in Hyderabad during a meeting with Animal Husbandry and Fisheries Minister Talasani Srinivas Yadav during the ongoing Gulf Food-2018, the annual food trade show in Dubai on Tuesday. Lulu Group representatives Salim and Vijay Kumar met the Minister and discussed the proposed meat processing unit to be established in 100 acres on the outskirts of Hyderabad. The unit will provide direct employment to 800 persons and indirect employment to another 5,000 people. The group had already signed three Memoranda of Understanding (MoUs) with the State government during the visit of Industries, IT and Municipal Administration Minister K T Rama Rao to Dubai recently. Under the MoUs, Lulu proposed to invest Rs 2,500 crore to construct 1.8 million sq feet area of mega shopping mall, set up food processing plant, and a logistics and export processing unit for fruits and vegetables. The new meat processing unit will be in addition to the proposed investments, the officials said.